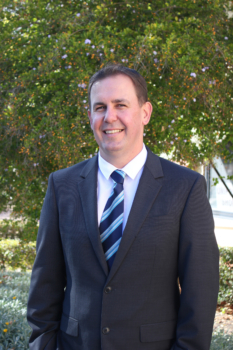 It is with great pleasure that I make my first contribution to the Newsletter as Principal of Peter Moyes Anglican Community School. I am absolutely thrilled and delighted to have joined the PMACS Community and I am excited for the journey ahead. My first few days at the School have been spent meeting staff and students and I am genuinely looking forward to engaging with more members of the broader School Community in the near future. I have already discovered much about what makes PMACS a wonderful school and feel very privileged to have joined such a special school community. In particular, my initial interactions with students have been very rewarding and I have been most impressed with their welcoming and approachable nature. In writing my first Principal’s Notes, I took the opportunity to review previous newsletters and explore some of the happenings at our School in 2018. It is wonderful to reflect on the many opportunities and events of the past two terms and the myriad learning experiences offered to all students. The staff have worked tirelessly to ensure the best possible learning opportunities for your children. These opportunities have occurred in the classroom, outside the classroom, on planned excursions and through the School’s extensive co-curricular program. These experiences have all required the commitment, dedication and enthusiasm of the staff to organise, coordinate and oversee. I am very grateful to the staff for their unwavering commitment to ensuring the best possible educational experiences for all children that attend our School. I am pleased to report that work on the School Chapel is now well underway, with significant earthworks that are already completed outlining the extent of the new development. The site was officially blessed by Archbishop Kay Goldsworthy in a ceremony on Thursday 19th July, 2018. Archbishop Kay and other guests including The Reverend Peter Laurence OAM, Chief Executive Officer of the Anglican Schools Commission and The Reverend Paul Howells, Rector of St Cecilia’s Parish joined members of staff for morning tea following the ceremony. The Chapel is the final component of the School’s Original Master Plan, the completion of which will allow the focus to shift to the next stage of growth and development for our School. It is anticipated that the Chapel will be in use for Easter services in 2019. My first day as Principal at Peter Moyes Anglican Community School coincided with the annual Middle School Interhouse Athletics Carnival. Blessed with perfect weather, the carnival was a fantastic event with excellent student participation and a number of new records set. Unfortunately there can only be one winner and I extend my congratulations to all students and staff in Durack House on your success. Due to the wet weather this week, the Senior School Carnival has been postponed and will now be held next week on Monday 6th August. The process for the appointment of Student Leaders for 2019 is now well underway. I was privileged to listen to the first run through of speeches from six female and four male candidates. The quality of each speech was quite simply outstanding and it will make the appointment process a very challenging one! It is safe to say that no matter who is elected Head Boy and Head Girl, the School is in safe hands. In concluding, I am honoured to be appointed Principal at this great School and look forward to meeting and working with the entire PMACS Community to ensure the best educational outcomes for our students.